BEACH PARADISE; INSTANT GET-AWAY! 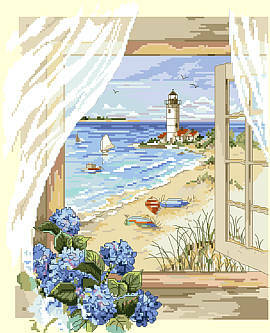 Enjoy this cottage view overlooking a long, sandy stretch of beach. Find refuge to rejuvenate and relax. Feel the rustling winds, take long walks and smell the hydrangeas. Contents: Stitch Count 149w X 187h, Finished Size on 14-ct, 10-5/8" X 13-3/8"